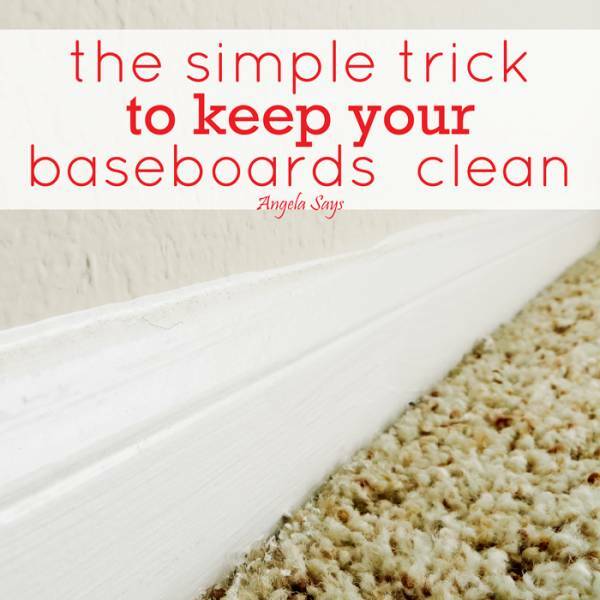 First, you will need to clean your baseboards. Use your favorite cleaning solution, soap and water, water, whatever floats your boat. 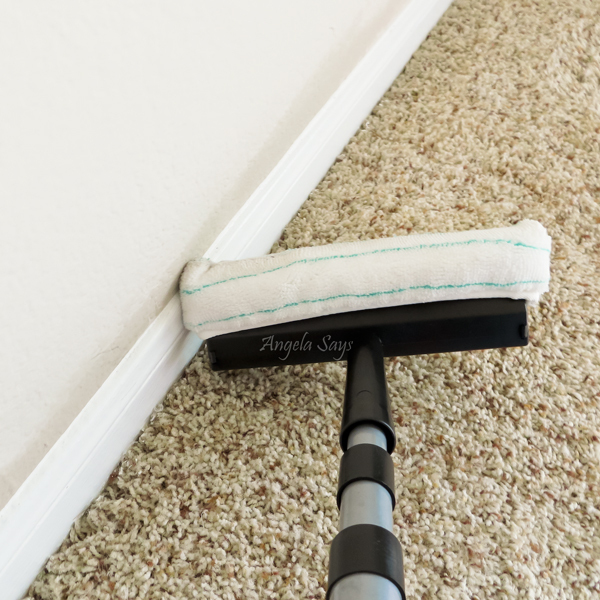 Use a soft cloth and wipe the baseboards clean. If you’re like me, use a pole with a window washing head so you don’t have to scoot along the floor or tie a cloth to the end of a broom stick. You can see the dirt already coming off from the baseboards. Much better, you’ll also be able to figure out where paint touch ups are needed, or decide that it looks fine as long as you don’t take pictures for a blog. 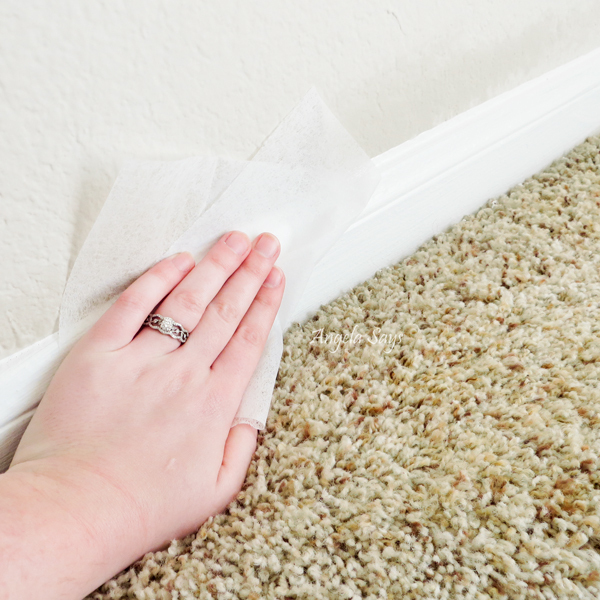 🙂 Once your baseboards are clean and dry, rub a dryer sheet along the baseboards to infuse them with anti-cling powers. Once infused with anti-cling powers, they will repel dirt and dust much better and stay cleaner for longer. 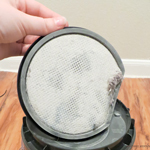 Alternatively, you can spritz a cleaning cloth with commercial fabric softener and wipe down your baseboards for the same effect if you do not have or buy fabric softener sheets. The box I have was $1 at the grocery store and has yet to be used for it’s intended purposes. 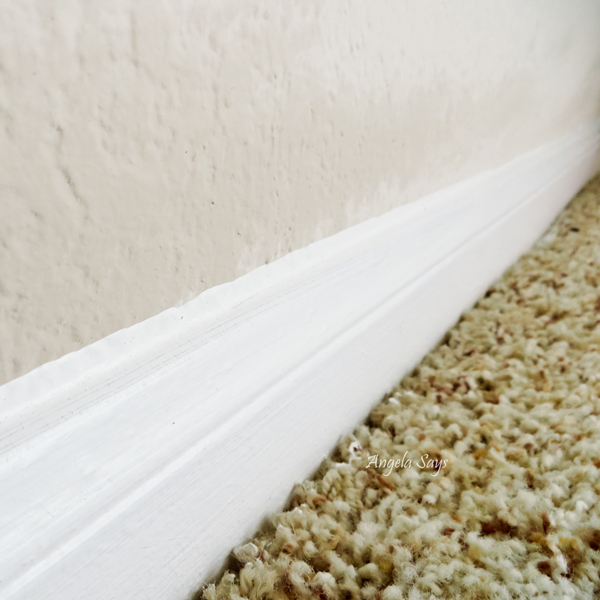 Anyhoo, this is a lazy great clever way to keep your baseboards clean. I still haven’t quite started my spring cleaning yet, have you? Excellent – thanks for this tip! Love this Idea. I do not love to clean and any quick and easy tricks to keep things spotless are VERY appreciated. Thank you so much. Anymore hints are appreciated too. You’re welcome! I have lots of quick and easy tips here. Thanks so much for stopping by! Wow! Who knew?! Thank you for this tip. I’m on it this weekend! You are so welcome! Let me know how it worked out for you. Ha ha, no judgement, I too was excited to try out this idea when I first heard about it. I sometimes even run my vacuum over them so far I’m really liking this method to keep my baseboards clean. GENIUS! Thanks for sharing! Found you via Tutorial Tuesday! I love this tip, thank you! What a great tip! Thanks for sharing, I hate dealing with baseboards. I assume you could do this same thing to blinds as well! I bet you could, I like that even better! I like the idea of using dryer sheets on blinds. I’m going to be a bit busy tomorrow cleaning blinds. Thank you for the fantastic ideas. You’re welcome! I’m glad Heather shared her genius idea for all of us. That has got to be THE easiest solution to a MAJOR problem in my house! Thank you loads! I have pinned this to my “home” board on Pinterest so other moms can get it! You are so welcome, thank you Bonnie for sharing it! TOTALLY doing this! I have clean my baseboards every dang week! THANK YOU! This is such a totally awesome tip! I had no idea! Can’t wait to try this. I also run a duster on mine weekly or so but with 4 cats, 3 teens and all there friends we get tons of dirt and dings. Let me know how it works out for you Tina.